The infamous UFO crash that occurred in 1947 in Roswell, New Mexico, is the extraterrestrial sighting that brought aliens into mainstream conversation. But the UFOs spotted just weeks before Roswell are even more fascinating, and much more carefully documented. Kenneth Arnold didn’t just experience one of the most interesting and well-researched UFO sightings of the 20th century — his sighting is ground zero for UFOs. After he saw nine unidentified crafts tearing across the sky near Mt. Rainier, Washington, in 1947, reports of UFO sightings dramatically increased, along with the now-colloquial term “flying saucers.” The world would never be the same. Most of the people who have seen UFOs sensationalize their stories in one way or another. Either they have weird alien stories, make any manner of surrealist claims, or even spin legends about Area 51 via abduction. However, Kenneth Arnold is one person who did not. Throughout his life he stuck to the relatively subdued and original flying saucer sighting facts that he had first stated in 1947. The fact that he never changed a word of his story is enough to make you wonder what he really saw flying over Washington in 1947, and if it really was a legion of flying saucers. Upon landing for fuel, he told the crew at the Yakima airport what he saw and they suggested that he saw missiles or maybe an experimental aircraft. Reporters were called in to interview him, but no one could shed any light on what Arnold claimed to have seen that day. Until his death in 1984 Arnold would maintain that the objects he saw over Mt. Rainier were of unknown origin. At the time of Arnold’s initial report, the military expressed genuinely interest in what he had to say. According to articles released at the time, Arnold was treated fairly and not ostracized for what on its face seemed like a pretty bizarre claim. It probably helped that Arnold was a respected and experienced pilot whom everyone seemed to admire. Additionally, at the time, there wasn’t yet a stigma surrounding people seeing UFOs. Even though there was some incredulity from the military about Arnold’s observations, he believed it was because the media continued to report on the copycat sightings that followed his legitimate sighting. In the end, the military came to the conclusion that “a man of [his] character and apparent integrity” wouldn’t lie about seeing something. While in his plane, Arnold was able to work out how large the crafts were, how far away they were from his plane, and their speed — which worked out to about 1,700 miles per hour. In 1947 Chuck Yeager was just breaking the sound barrier which is a little over 700 mph. Whatever Arnold saw was much more advanced than what the government was working on at the time. His mathematical calculations and knowledge about flight and piloting lent credibility to his claims, but ultimately didn’t help solve the mystery. Throughout the initial phases of Kenneth Arnold’s fame he faced a number of skeptics who looked to debunk what he claimed to see. The most curious of these debunkers are the people who believe that Arnold saw crafts, but that they were piloted remotely. When interviewed by the Chicago Times, a United Airlines pilot said that he thought that the UFOs were piloted by someone on the ground. He also believed that the crafts were manmade and that they were being used in “experimental operations” by the armed forces. To Arnold’s credit, he agreed that the crafts could have been piloted remotely, he didn’t really care if the UFOs belonged to aliens or not. The issue that stuck with his was that if the crafts were being used by the US Army, then the American people deserved to know. Even though the military didn’t fully believe Arnold’s claims, they at least treated him with respect. But then the Roswell incident occurred and people lost their minds. In early to mid-July of 1947, an unidentified flying object crashed in the Nevada desert. The military claimed that it was a weather balloon, but people began talking about the extraterrestrial bodies that were taken from the crash sight along with a mysterious metal, and the story exploded. After Roswell, the military went out of their way to debunk every UFO story that they came across beginning with “Project Grudge.” Following the across-the-board debunking by the military, amateur investigators also started coming out of the woodwork to disprove Arnold’s story. Various investigators alternately claimed that Arnold saw a mirage, “pelicans,” or meteors. It’s important to remember that Kenneth Arnold was a normal guy until the day he saw the nine flying saucers, but the moment his story went national he became a celebrity. Arnold claims that a preacher from Texas called him out of the blue to proselytize about the end of the world, but that wasn’t as bad as the woman who freaked out when she saw him in a cafe. He claimed that she saw him and screamed, “There’s the man who saw the men from Mars,” as she ran out of the diner. In an issue of the Spokane Daily Chronicle from June 27, 1947, multiple reports of “flying discs”and “saucer-like objects” were made after Arnold’s story of the nine ships flying near Mt. Rainier. A Eugene, Oregon local named E.H. Sprinkle claimed to have captured photographic evidence of a flying saucer near his home, although it was later revealed to be nothing more than dust. 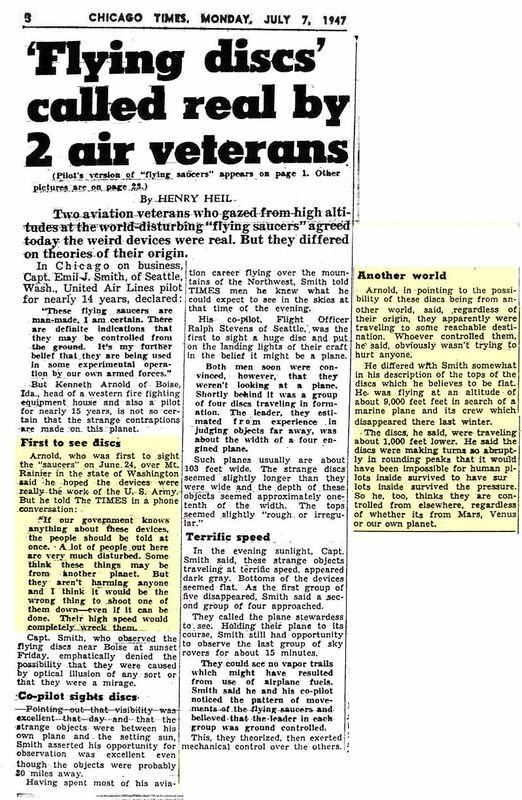 An article from that paper also recounts the stories of men and women from Oregon and Washington who saw various forms of flying saucers in the days following the initial sighting. Mrs. Ethel Wheelhouse even claims to have seen “whatzits” speeding across the sky near Yakima, Washington.